This week the Windermere Florida Mayor issued a warning for all pet owners to keep extra vigilant watching over your pets while outside. Owners of cats and small to medium-sized dogs need to be extra cautious. Coyotes have snatched at least one small poodle this week. Remains of a cat have also been found. Several pets have been reported missing this past fall and within the past few weeks. The warning has only been issued in Windermere, however close by neighborhoods like Ocoee, Winter Garden and Dr. Philips should also take note. Coyotes are wolf-like wild dog. They are nocturnal animals but you may see them late into dawn or dusk. Daylight appearances could be a warning sign that the coyote is ill or injured. Make sure you secure all trash as you would to ward off any animal. Finally, make sure to keep your cat or dog indoors during the nighttime hours. What do I if I see a coyote? Trying “hazing” the coyote by using a loud, authoritative voice to scare it away. Make yourself appear as large as possible. Trying throwing rocks or whatever is handy near the coyote to force it to flee. Do not run or allow your pet to run or chase the coyote. If the coyote is not afraid and doesn’t seem bothered by you – contact Orange County Animal Control. It’s a hard thing to do, but a coyote that is not afraid of humans can become a bigger threat. If the coyote becomes aggressive towards you, or attempts to attack you – call your local law enforcement immediately. You’ve finally gotten to the point when your dog is regularly responding to your vocal or hand cues for behaviors. It’s now time to pull back with the treats and replace them with other rewards. For my dog, the sound of the leash is an exciting time. Rewarding him with a walk for a job well done is always welcome. For other dogs some fetch with a squeaky ball or frisbee is like heaven! The point is you’ve now moved on to “life rewards”, rewards based on other things your dog enjoys beyond treats and food. You’re showing your dog you indeed are NOT a treat PEZ dispenser. Instead he is learning that by doing as you ask, and making you happy, he gets something that makes him happy too. Sure we can still pepper in treat based rewards as a surprise every now and then but you want to make sure you diversify your rewards. Dogs love surprises like this and you’ll be motivating them to work even harder to keep the rewards coming. Have a question for me about your dog’s behavior? Call 321-345-7387 for a free phone consultation. How do I define reward based training versus a bribe? Ask a dog to do something. The dog does it. Give him a treat. That treat is a reward. Ask your dog to do something and it’s something he’s done repeatedly before. But this time there’s no action. So you wait. Maybe you ask again. You reach into your treat bag and suddenly your dog is completing the requested task. You asked him to do it and he didn’t until he knew the reward. A good dog trainer will help you avoid this pitfall of dog training. If you find yourself only getting a reaction once the treat is visible, your dog has just trained you! With professional dog training we use techniques that avoid bribery and continue rewarding good behaviors. Knowing when you’re teetering into bribery is a skill that your dog trainer can see, but you may not. I’ve got a couple more days of insight for you so keep checking back. Don’t hesitate to call me if you have any questions about your dog’s behavior. Dial 321-345-7387 for a FREE telephone assessment. Big Paw Pet Care uses a “PAWsitive” or rewards based training method when training our client’s dogs. At first you feel like a PEZ dispenser handing out treat after treat. What we really want to get to is making eye contact, praise and petting just as rewarding as treats. But first you have to get the dogs attention. We call dogs “man’s best friend” and “loyal” but the reality is dogs are fairly self-serving. Ask your dog to perform any task and he’s immediately asking “Whats in this for me?”. You could say dogs are natures capitalists when it comes to their relationships with humans. So we hand out treat after treat for the simple tasks as we start. By being systematic with rewards, the dog is more likely to repeat the behavior we want. When you reward a job well done, the dog will continue to “show up for work”. A first step is deciding what is rewarding to your dog. Some dogs love cheese, others hate it. For some dogs rough petting means “good boy” where others may not like touch at all. So we find what works for your dog and start our training there. Over the next few days I’ll post a few more insights into the dog training process. In the meantime, if you have any questions about your dog’s behavior feel free to call me at 321-345-7387 for a FREE telephone assessment. Now that the weather is warmer many of us are looking forward to going to the beach, basking in the sun and wearing lighter clothing. It’s an awesome time of year and one of the reasons I love Florida. Many of our pets enjoy basking in the sun, in a sunspot just inside those sliding glass doors or lay next to a window were the sun shines through. However, they can’t dress for the occasion like us, so instead, they’ll move away when it becomes too hot for them. My girl Sookie checking out some tastey waves at the beach. Some pets are less fortunate and end up in a backyard without shade or inside a vehicle with nowhere to go. Even with completely open windows a vehicle can reach extremely hot temperatures, ultimately sending a pet into a heat stroke very quickly. It’s important to never put your pet in this type of situation during the summer months. Some breeds are much more susceptible to heat stroke than others without preparation you could inadvertently put your pet in a situation just as dangerous as leaving them in a backyard. So if you do take your pet to the beach, make sure it’s not drinking the ocean water, as it may lead to hypernatremia, a type of dehydration, which could result in kidney failure. Keep plenty of water on hand at all times and make sure you understand your pet’s limitations during walks or activities in the sun. Knowing the normal temperature of your pet is another great tool as the temperature range is large depending on the pet. Have a digital thermometer handy in your pet first aid kit! Enjoy the summer and sun with your pets, but as my mother always said, “be sensible about it”! Many of us may spend the Memorial Day visiting grave sites or memorials for loved ones who have served their country. Others will take in a parade honoring our soldiers who have made the greatest sacrifice of all for their country. Each year, Big Paw Pet Care also takes a moment to remember the soldiers and dog teams of our military who work together to keep us safe and free. 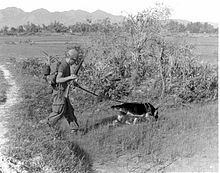 U.S. Army scout dog “Chief” on patrol in Vietnam. Memorial Day is a day of remembrance for the men and women who died while serving in the United States Armed Forces. Originally called Decoration Day, it originated after the American Civil War to commemorating the Union and Confederate dead. But in the 20th century Memorial Day was extended to honor all Americans who have died serving the United States of America. The first official use of dogs for military purposes in the United States was during the Seminole Wars. The American Pit Bull Terrier was used in the American Civil War to protect, send messages, and as mascots in American World War I propaganda and recruiting posters. Dogs heading to the front lines of the Solomon Islands. Pacific, 1943. In October 2013 the first National Monument dedicated to military so dogs debuted in San Antonio Texas. Military Working Dog Teams National Monument was created by sculptor Paula Slater and depicts the modern military handler and four dogs — a Doberman, German shepherd, Labrador retriever and Belgian Malinois, all breeds used in wars. The 5 figures stand on a pedestal, in front of a large granite wall. On one side of the wall there will be photos etched in black marble veneer showing dog teams in combat from the different wars. The Military Working Dog Teams National Monument at night. The other side has an inscription written by John Burnam. Burnam is a veteran of the Vietnam war with the Army’s 44th Scout Dog Platoon. He worked with 2 different dogs during that period, Timber and Clipper and is the author of 2 books about his experiences, “Dog Tags of Courage” and “A Soldier’s Best Friend.”. “[Clipper] saved my life and saved the lives of others by alerting on ambushes, snipers and booby traps. I wanted to give something back to these animals that have done so much and asked for so little, except for food and water and the love of their handlers,” said Burnam. The Military Working Dog Teams National Monument is located at JBSA Lackland and maintained by the Airman Heritage Foundation. For more information, please visit the monument’s Facebook page. Article sources: Wikipedia.com and the former foundation: jbmf.us.